I left the comfort of the hilly lanes around Kelvedon and Coggeshall to set out west into the barley plains, along a hedgeless lane which always seemed to be into the wind. My goal was a church which the revised Pevsner claims to be of outstanding interest... its medieval fabric remains intact with only a minor restoration of 1905. This was All Saints, Bradwell. Locked. What a stunningly beautiful church, but what a remote spot, and how bleak it must be in winter! The nearest house is about a mile away, and it has only an apparently abandoned farm and a plantation of conifers for company. I looked through the window and saw wonderful things, old woodwork, wall paintings, old glass. There is a noticeboard that records that the minister lives in Colchester, but there was also a full list of churchwardens, treasurers, etc. I rang the first churchwarden, but her husband answered - she was at work. I told him I wanted to see inside and he suggested I ring back after six and arrange a time. Would tomorrow be a possible time? No, she was at work then too. Would it be worth ringing the other warden? If you like, but she'll be at work too. I gave up at this point. What really is the purpose of a church if it is left as a vulnerable locked house of treasures miles from anywhere. I fear for the furnishings, and fear this one will be redundant in ten years. 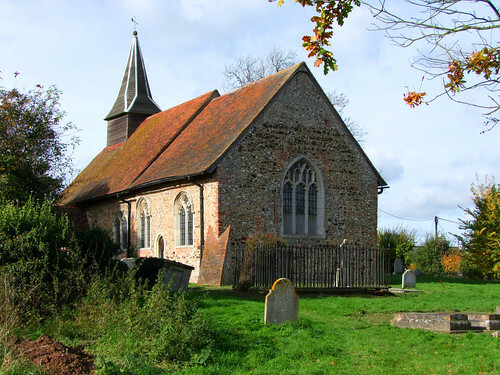 But I shall go back - this is a joint parish with Sistead, which I also want to see inside, so I shall make an arrangement for a Saturday in the summer. It is not, after all, the church's fault. I felt profoundly sorry for this pretty church.